Falling panel costs make PV appealing, mandates demand solar on the grid—CSP can make both easier. Concentrating solar power (CSP) technologies that use mirrors instead of photovoltaic (PV) panels are challenging to finance. CSP is a newer technology that is just starting to bring down costs through economies of scale and improved efficiencies. But there is a compelling rationale for concentrating technologies. PV doesn’t entirely answer the needs of the transmission system, while CSP with thermal energy storage (TES) can. In doing these things, Helman explained, it saves money. Peak generation has higher value. Furthermore, according to Helman, “as more renewables are added, it will change energy market prices.” First, PV will displace “older, more expensive gas plants.” Then, “right after the daylight hours, as other plants -- primarily gas -- are ramped up to compensate for the rapid ramp-down of inflexible solar production,” he explained, citing simulations by the California Independent System Operator Corporation (CAISO) that show that stored CSP generation can be dispatched. “The costs of these reserves are currently estimated to be in the range of $4 to $8 per megawatt-hour in California by 2020 or at high penetrations in other systems,” according to Helman, especially where “gas peakers or other types of storage to support integration” are built. As we have reported, BrightSource Energy recently added thermal energy storage (TES) capability to three of its power purchase agreements (PPAs) with Southern California Edison (SCE). 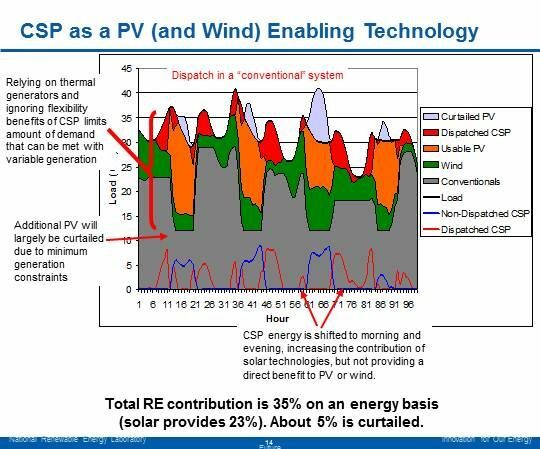 The implication: A balance between PV and CSP will make it possible to use more PV -- and to use more sun. According to NREL calculations, Helman noted, if a future gas price of $4.50 per MMBTU is assumed, a relative fuel savings benefit of CSP with TES over PV is about 0.5 cents per kilowatt-hour. The total value of CSP with TES has been estimated by NREL modeling and simulations. 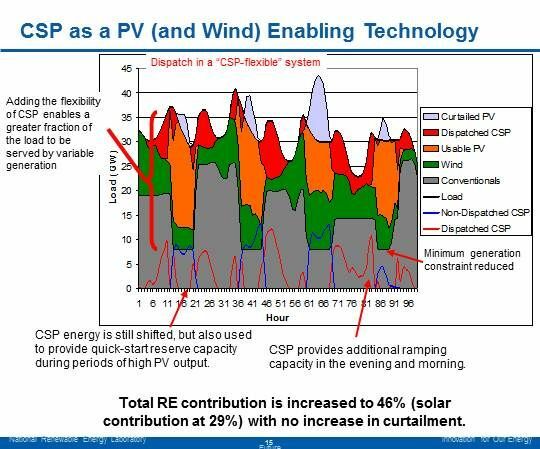 At 10 percent to 15 percent solar, with gas prices in the range of $4.50 to $9.00 per MMBTU, the estimated value of CSP with storage is an additional 1.6 cents to 4.0 cents per kilowatt-hour. The NREL research, according to Dr. Helman, breaks those values into four categories: 1) The energy shifting value is ~0.5 cents to 1.0 cents per kilowatt-hour; 2) The increased capacity factor value is ~0.7 cents to 2.0 cents per kilowatt-hour; 3) if PV is 6 cents per kilowatt-hour, the value of reduction in curtailment is estimated at ~0.3 cents per kilowatt-hour; and 4) the reserve and integration value is 0.1 cents to 0.7 cents per kilowatt-hour. 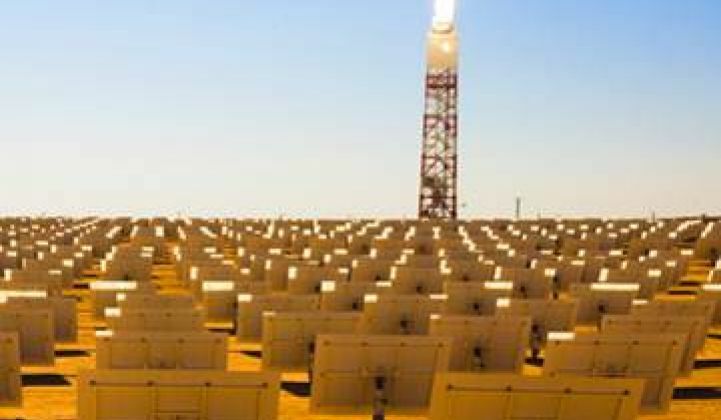 A real-world approximation of the total value of CSP with TES is that the original PPAs with SCE set BrightSource’s seven solar power plants’ obligation at approximately four million megawatt-hours of electricity per year. With the addition of TES at three plants, new agreements set the same level of production, but with one fewer plant.